“In the vision I saw myself, Charis and Jaydeen playing outside in our yard with a soccer ball laughing. 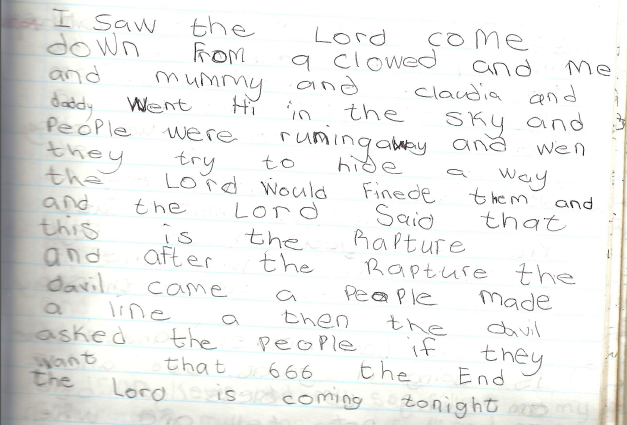 I suddenly saw the Lord standing close to Charis’ bedroom window. I saw a tall figure dressed in white and gold robe. I could not see His face, but I saw the Lord had pure white hair; His face was covered with blinding light. I ran towards the Lord and I said crying, “Lord I am very sorry for the wicked things I have done, please forgive me”. I tried hugging the Lord, but the light surrounding Him prevented me from reaching closer to Him; at the same time I heard in my mind the words, “THE LORD IS NEAR!” This was the end of the vision”. We believe the above vision is authentic. Claudia was literally crying uncontrollably when she told us her vision. She was so convinced that she even challenged us to ask the Lord (through Charis) on the truthfulness of this vision. This vision has been confirmed to be true and from the Lord. Brethren, we have received no Word from the Lord for this week’s article. As you may see, we too are being tested (in addition to what we shared in last week’s “How to Know God is Testing You” article). Without divulging the details of the test that we are currently facing, The Lord has been subjecting us every year, at different times, to some tests, and we hope to share with you at a later stage if the Lord permits. Please pray for this family and ministry for strength and increase of faith! As a ministry, and after prayer, it seemed good to the Holy Spirit and us that we share part of our testimony with you. This will be a rather brief account with some excerpts from our ‘testimony book’. 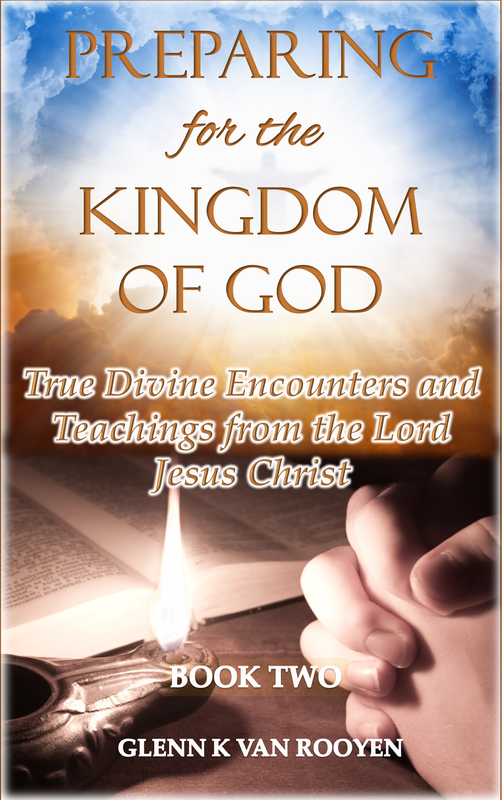 We call it so because the messages we received from the Lord have been recorded and preserved in this book(s). As Christians, we have a mandate and command from the Lord to tell everyone “…what great things God has done for [us] you” (Luke 8:39). From the onset, we do not claim to have a superior testimony to that of other believers in Christ, nor are we attempting on setting ourselves apart as having the best testimony. We humbly share the truths from the Lord for your edification. To us, and many other believers in this ministry, our testimony, together with the testimony of the apostles and others, is convincing proof that Jesus Christ, the author of the Christian faith, is ALIVE (Revelation 1:18). Furthermore, we must recall that the Christian faith is based on the testimony of the work of Christ in the lives of the earlier witnesses (Acts 2:32; 5:32), with the deep convicting power of the Holy Spirit convincing us through the evidence of our outward living. Christianity is not based on a forced lifestyle and carefully coded rituals, but on a joy-driven appreciation for the saving power of Christ Jesus (John 15:11). In addition, every Christian has been given a testimony that lines up (or should line up) with the Bible. Therefore, the Christian message is a joyful testimony of faith to what the Lord Jesus has produced in our lives. We encourage Christians everywhere to share their testimony of love, peace and hope in Christ Jesus without being ashamed of their faith. Don’t allow the offensive insults from the worldly-driven people to slow you down; excel in love, good works and the joy of your testimony (1 Corinthians 4:1-2). Keep your testimony and don’t lose your confidence in Christ (Hebrews 10:35). As it is, we have been sharing our testimony through various messages, visions, experiences and words from the Lord with you. 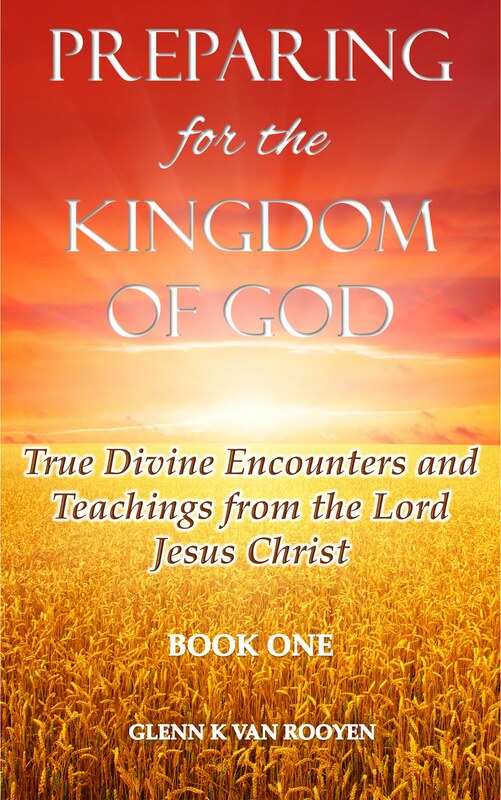 Remember, we freely share what we have heard and experienced in order to encourage you in your most holy faith in Christ Jesus while preparing you for the Kingdom of Heaven, which is very, very near according to the Lord’s own Word to us. 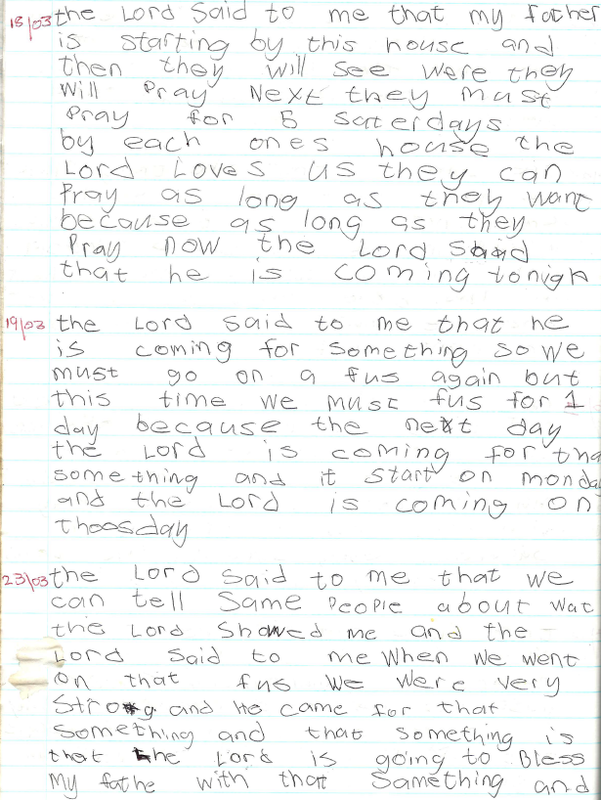 Below are some words Charis wrote down as she heard from the Lord. My wife and I later encouraged her to write down exactly what the Lord said, instead of just telling us what He said. We have decided to selectively share, without any alterations, from the earlier accounts, which started the establishment of this ministry. The latter of her writings are direct commands and some serious rebukes; it is not our intention to ‘expose’ our hidden sins, so these will therefore not be made available here. 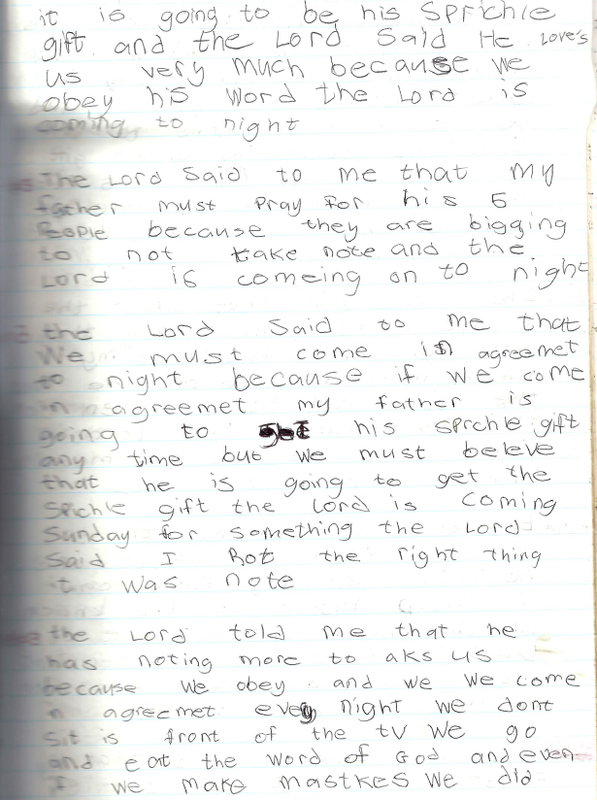 It must be considered that Charis was only nine and half years when she started writing down the Lord’s words. Her spelling was therefore based on the sound of words from the Lord, and that is how she wrote at the time. Therefore, for your better understanding we have transcribed some passages, and included pictures of the original messages at the end. The Lord said to me that my father (Glenn) must starting praying by this house (our place) and then they will see where they will pray next. They must pray for five(5) Saturdays by each one’s house. The Lord loves us. They can pray as long as they want because as long as they pray now the Lord said that He is coming tonight [This was for His next visit]. The Lord said to me that He is coming for something so we must go on a fast again but this time we must fast for one (1) day because the next day the Lord is coming for the something and it starts on Monday. The Lord is coming on Tuesday. The Lord said to me that we can tell some people about what the Lord showed me and the Lord said to me, when we went on that fast, we were very strong and He came for that something. And that something is that the Lord is going to bless my father with that something and it is going to be his spiritual gift and the Lord said He loves us very much because we obey His Word. The Lord is coming tonight. The Lord said to me that my father must pray for his five (5) people because they are beginning to not take note and the Lord is coming tonight. The Lord told me that He has nothing more to ask us because we obey and we come in agreement every night. We don’t sit in front of the TV. We go and eat the word of God (Bible reading/studying) and even if we make mistakes, we did ask forgiveness and He loves us for obeying His Word and we must continue what we are doing. The Lord is coming on Wednesday and He is almost done. He will show me about the spiritual gift for my father and for the 5 people and what they must do. We already did do what the Lord wanted us to do. My daughter Sophie is going to get her gift of tongues after the prayer meetings and you must not be afraid because you already can pray in tongues and I love your father and mother too. I am coming on the 24 [April 24th]. The five(5) People must go on a fast for three (3) days and the fast starts Monday and if they go on the fast they must go and pray by each one’s house for 3 days and they may continue with the prayer meetings for three(3) weeks. I love you too and I love the five (5) people too and I have forgiven my son Stanley for out bursting. I am coming tonight for something very big and your father is going to like it. I saw the Lord come down from a cloud and me and mummy and Claudia and Daddy went high in the sky and people were running away and when they tried to hide away, the Lord would find them and the Lord said that “This is the Rapture” and after the Rapture, the devil came and people made a line and then the devil asked the people if they want that 666. The end. The Lord is coming tonight. You and your mother and father are doing a great job when you read [The Book of] John. I like it. You must continue what you are doing. I love you and I am coming Wednesday. You and your mother and father must just pray and your father must not worry about anything. I will provide and I love you. I am coming on Thursday. 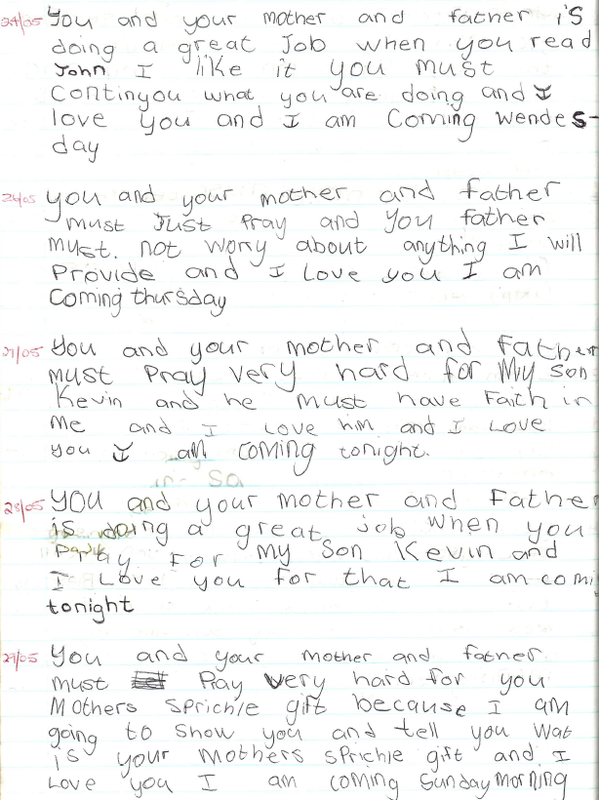 You and your mother and father are doing a great job when you pray for my son Kevin and I love you for that. I am coming tonight. You and your mother and father must pray very hard for your mother’s spiritual gift because I am going to show you and tell you what your mother’s spiritual gift is and I love you. I am coming on Sunday morning. You and your mother and father must pray very hard so that you won’t lose this house and you must go on a fast on Saturday for half day [from 6 to 6] and I could see that the Home cell people were blessed by the Word. 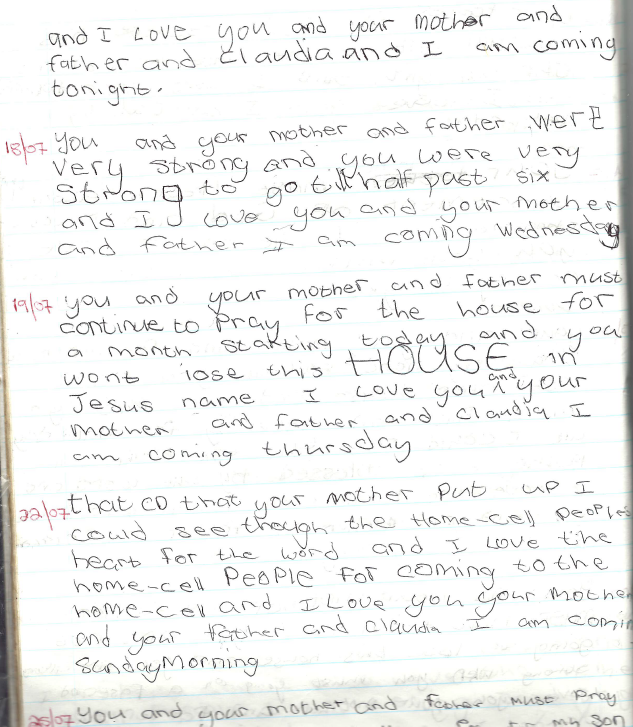 I love the Home cell people and I love you and your mother and father and Claudia. I am coming tonight. You and your mother and father must have faith that you are not going to lose this house and you are always strong when you must going on a fast and l love your mother and father and Claudia. I am coming tonight. 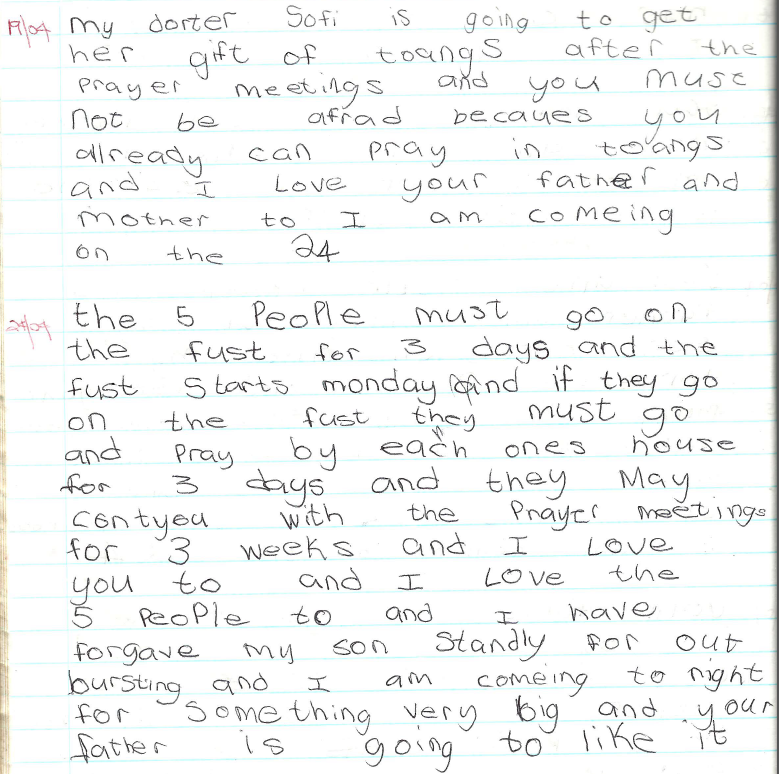 I liked it when your father did put the house in the prayer request. And I love you and your mother and father and Claudia. I am coming tonight. [Charis was asleep when I came from late shift work that evening. 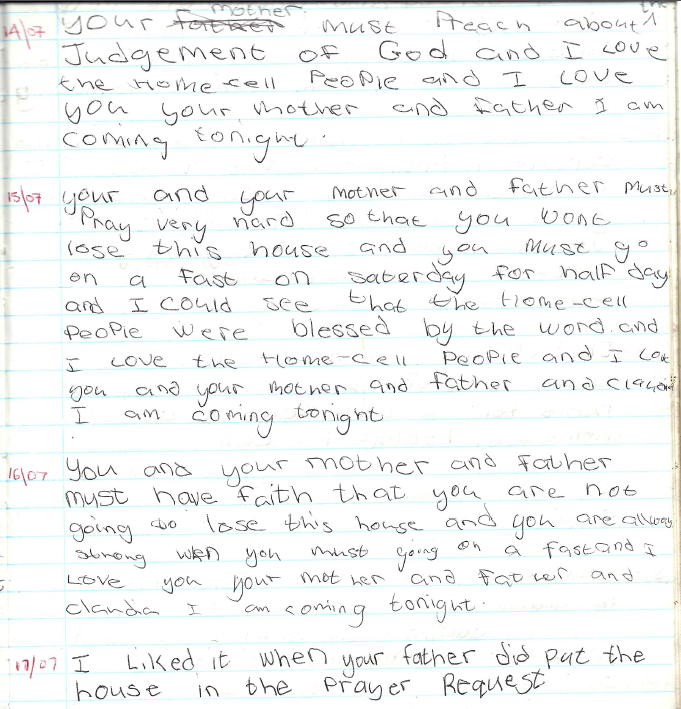 She did not see me entering this request into our prayer book of request, but the Lord did to my amazement]. You and your mother and father were very strong and you [Charis being only 9 and half years then] were very strong to go till half past six [18:30] and I love you and your mother and father. I am coming Wednesday. You and your mother and father must continue to pray for the house for a month starting today and You won’t lose this HOUSE in Jesus' Name. I love you and your mother and your father and Claudia. I am coming Sunday morning. Stay blessed and focused on Christ; be faithful, enduring and praying.